I'm not sure whether to use it or not because of the scuffs and scratches that this case is apparently giving the chamfered edges of the Note 4. UPS just picked up mine along with the Neo Hybrid, they are heading back to Amazon for a refund. 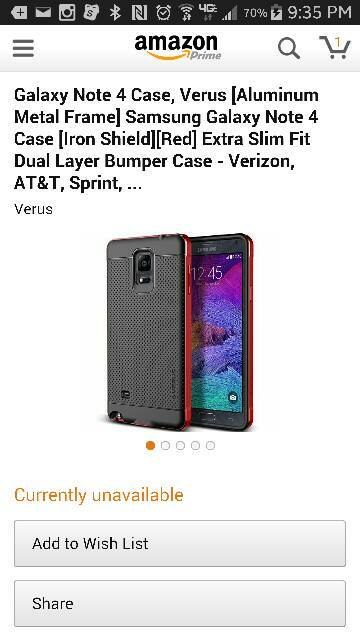 Why are you sending the Neo Hybrid case back? I'm sending my Neo Hybrid back because I can't use the heartbeat monitor and it covers one of my microphone holes. Other than that, it's damn nice. Hes right I cant use mine either. Havent tried to use it on my Tough Armor case either but i suspect the same thing. Loads of cases with that issue, the microphone one. Sad that either Samsung changed the design and didn't tell anybody or that the manufacturers jumped to production with an early prototype or something. Maybe different carrier versions have different microphone positions, who knows. The Samsung one, though, has an elongated opening for the left side pinhole, while the right one does have a precise cutout. I guess they do have different positions for different versions. I have the Spigen UC case and had it on for a few days. It scratched the top and bottom of my phone. Why can't I turn my magazine off? Why won't TTS change to a different input language on my Galaxy S4?